MANCHESTER, Conn. - When Keith Wearne goes grocery shopping, checking out with a cashier is worth the few extra moments, rather than risking that a self-serve machine might go awry and delay him even more. Most shoppers side with Wearne, studies show. And with that in mind, some grocery store chains nationwide are bagging the do-it-yourself option, once considered the wave of the future, in the name of customer service. "It's just more interactive," Wearne said during a recent shopping trip at Manchester's Big Y Foods. "You get someone who says hello; you get a person to talk to if there's a problem." Big Y Foods, which has 61 locations in Connecticut and Massachusetts, recently became one of the latest to announce it was phasing out the self-serve lanes. Some other regional chains and major players, including some Albertsons locations, have also reduced their unstaffed lanes and added more clerks to traditional lanes. Market studies cited by the Arlington, Va.-based Food Marketing Institute found only 16 percent of supermarket transactions in 2010 were done at self-checkout lanes in stores that provided the option. That's down from a high of 22 percent three years ago. The reality, though, was mixed. Some shoppers loved them and were quick converts, while other reactions ranged from disinterest to outright hatred  much of it shared on blogs or in Facebook groups. Wearne, 39, a Tolland resident who owns a power-washing service, reluctantly used a self-serve lane at the Manchester Big Y to ring up granola bars and a 12-pack of Miller Genuine Draft but had to wait while a clerk checked his identification. If he hadn't seen the clerk standing there immediately ready to help, he said, he would have used the traditional lanes, as he usually does. But for time-crunched Greg Styles, a self-described "get-it-and-go type of guy," the top priority is paying and leaving without lingering in a checkout lane. Styles, a 47-year-old South Windsor resident, says the convenience of the self-serve lanes fits into his busy life as a college lacrosse coach and father of 7-year-old twins. "I'm not happy about it, not at all," Styles said of the change, ringing up baked goods and chicken breasts on a recent afternoon at Big Y's Manchester store. "I like to get in and get out. These lanes are quick and really easy, so I use them all the time." He's not the typical shopper, though, according to research. While some chains are reducing their self-serve options, others say they're keeping it in place along with the traditional lanes because they think giving shoppers that choice is an important part of customer service. "Our philosophy is giving customers options. People shop in different ways and we want to accommodate their preferences," said Suzi Robinson, a spokeswoman for Stop & Shop Supermarket Co., which has self-serve lanes in about 85 percent of its nearly 400 stores in the Northeast. 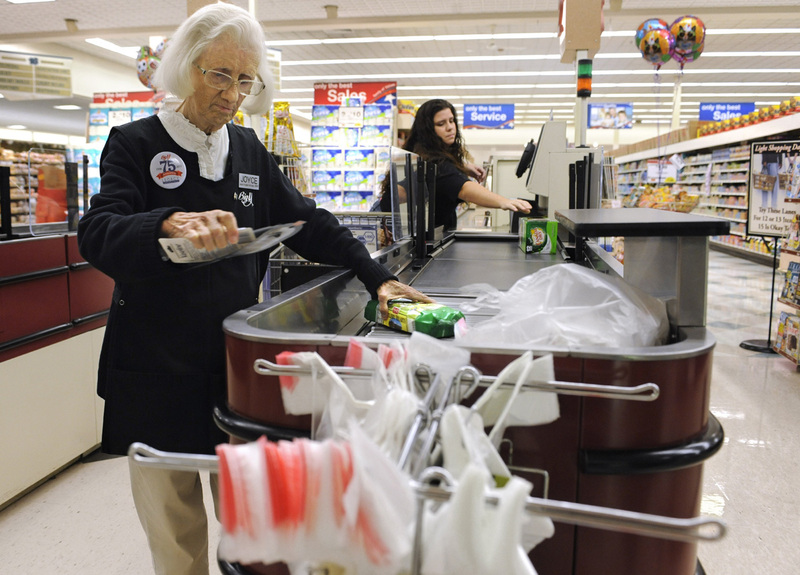 Another chain, Boise, Idaho-based Albertsons LLC, has said it's phasing out self-service lanes. Kroger says it's keeping the self-service option because customers like it, although one remodeled store replaced it with another quick-checkout method that uses a cashier. Phil Lempert, a Santa Monica, Calif.-based food industry analyst, noted that supermarkets have a few other motivations to get rid of the self-serve lanes beyond customer service. They will eventually need to replace their checkout computers to read newly emerging types of bar codes, so there's little business sense in keeping and replacing those self-serve machines if they're not well-used anyway, he said. Perhaps more important, he said, the growing trend toward using bar code-reading programs on smartphones is likely to change everything in supermarket shopping over time. Some scholars who follow the retail food industry say decisions by Big Y and others to do away with the self-serve checkout lanes aren't necessarily the death knell of the trend. Home Depot and some other businesses, which cater to customers with a do-it-yourself mentality, report success with their self-serve lanes. But not all supermarket shoppers share that mentality, and whether they embrace or reject the self-serve option may come down to demographics  such as whether they're in a tech-savvy region  and other factors that the supermarkets cannot control. "I think some of the stores are just deciding that, on the balance, it's a negative. Other stores, because they have a different composition of shoppers, are deciding to keep it," John Stanton, a professor of food marketing at St. Joseph's University in Philadelphia, said of the self-serve option. "I don't think this is as much a referendum on the technology as much as it is a match between the technology and the customer base," he said.